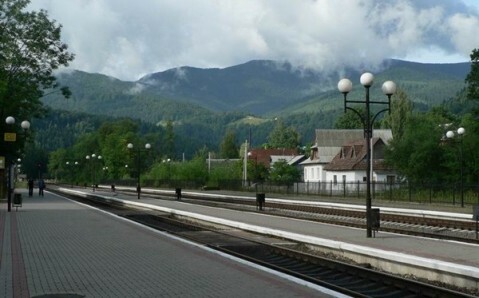 Situated in the picturesque Prut River valley, this little town is one of the most famous tourist centers of the Carpathian region. First and foremost, Yaremche is a popular ski resort. 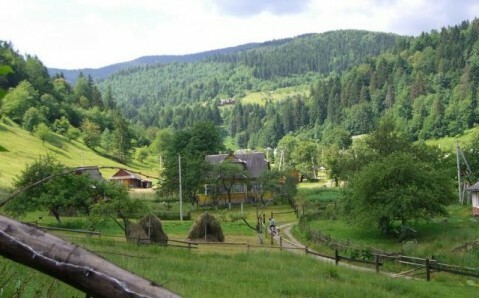 Its numerous visitors are attracted by its breathtaking mountain landscapes, pure air, unique Guzul character, and variety of leisure activities. Already in the 19th century, well-off citizens of Vienna, Warsaw and Krakow arrived at Yaremche to rest and to improve their health. In the Soviet period, the town was famous for its numerous vacation houses and sanatoriums, accepting thousands of people for treatment. 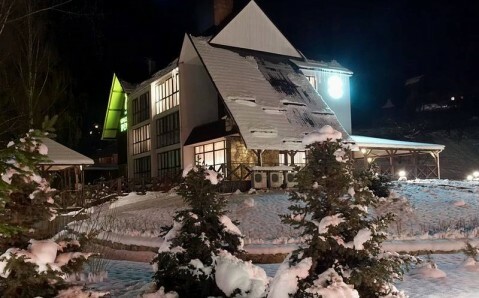 Its health resorts are most useful to those who wish to get rid of respiratory illnesses, as Yaremche’s unique climates stimulate the process of recovery. During the winter, Yaremche is populated with skiers and snowboarders. Winters here are a skier’s paradise: it is not too cold, and there is very little wind, but a lot of snow. The mountain slopes especially good for beginners, but are unlikely to impress professionals. 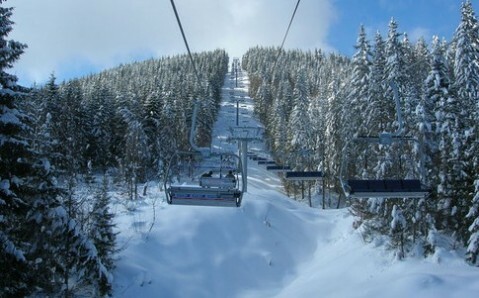 Thus, more experienced skiers often choose to visit neighboring ski resorts - Bukovel, Vorohta and Yablunitsa. But you can admire Yaremche’s unique architecture of all year round! You will find many interesting churches, monasteries, and landmarks in the town. Yet perhaps the town’s the main attraction is the Probiy waterfall. It is certainly not the highest (it is only 8 meters – 26 feet – high), but it is the most powerful and picturesque waterfall in all the Ukrainian Carpathians. 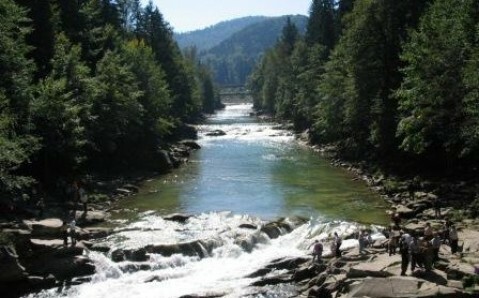 The torrents of the Prut River, which find their way through the stones, create an unforgettable show, which you can watch from a small footbridge that crosses the river. Not far from the waterfall lies a well-known souvenir market, which has already become one of Yaremche’s most popular attractions. You can buy original handicrafts of local craftsmen, at the same time getting acquainted with the distinctive Guzul culture. The road from the souvenir market leads to another remarkable landmark, the Dovbush Rocks. It is an awe-inspiring mound of boulders whose peak is 80 meters (260 feet) high. It was created 70 million years ago at the bottom of a sea, and it truly resembles a fictional marine creature in its fanciful shape. A mysterious cave hides in the rocks, where, legends say, a band of local bounty hunters used to hide. The leader of these Carpathian militiamen (called “oprishki” in Ukranian) was Oleksa Dovbush, for whom the rocks were eventually named. This wonderful place attracts not only curious travelers, but also hikers and rock climbers. In short, Yaremche is a real paradise both for those who enjoy spending their vacation relaxing, and those who are fonder of educational excursions and outdoor sports. The kinds of outdoor activities that you can partake in vary greatly: depending on the season, you can go hiking in the mountains, rafting, horseback riding through the forest, riding ATVs, and much more. 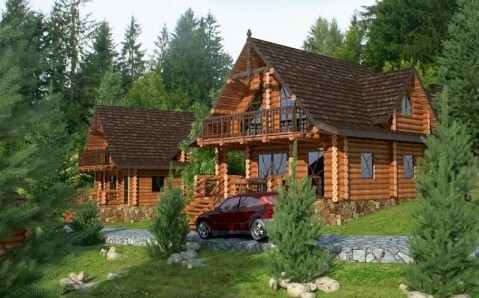 That is why resorts in Yaremche pulse with life all year round! Location: Yaremche is only 65 km away from Ivano-Frankivsk, so it is easiest to transit from there by one of the fixed-route taxis or buses that depart every 30 minutes. You can also reach Yaremche also from Ternopil, Chernivtsi and Lviv quite easily.